I thought of a way to transfer multiple loafs of bread onto a preheated stone/sheet in the oven without parchment paper, or sliding them off a classic peel. This was in response to an issue I had yesterday with transferring my 3 mini baguettes onto a heated upside down baking sheet using a long thin piece of cardboard while simultaneusly living in a country where parchment paper and pizza peels are hard to find. As expected, all three were very difficult to put in and the ovene door was open for a good while. So I spent some time trying to think of something while being fully inspired by the roll away cloths you see in videos with professional bakers such as here: https://youtu.be/DkHsbchF2-g?t=436 . After thinking of different ways, the way I'm about to introduce is what I decided to do. It's basically a large pizza box, where one side (top in my case) is bent several times at short increments to make it bendable in either direction (think: waves). The other side is left as it is. The wavy side will hold the bread and the straight side will go under with the connecting part being forward. Since the "peel" side is bendy, it won't support any bread properly so a stick goes under it between both cardboard sides. Now here's the trick: you grip the stick enough to support the peel but open enough to have it slide through your grip. 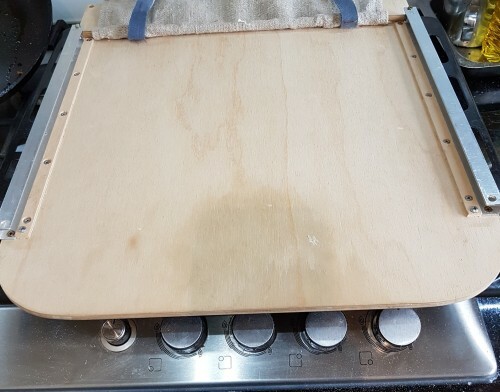 Then you just pick up the whole contraption with the dominant hand holding the peel and stick, and the other hand holding the bottom side, you put the whole thing over the baking stone/sheet in the oven, and you pull the bottom side out while holding your peel hand stationary. The pulling will both bend the peel side down because of it's many bends and will push the stick out as well because of the grip; giving that satisfying drop. I really wanted to share this thing. I'll be testing this out on some bread soon hopefully. This peel is what you want to emulate. The peel is for sale, although I don't know the name of it or who makes it. Great product. Couldn’t bake without it. One of those “Why didn’t I think of that?” Inventions. Thank you Alfanso and Toad.de.b for your comments. The super peel looks like a really elegant product. It's very hard to find non basic things in my country (even a regular pizza peel can be tricky). I'll use the design methods of the super peel if my current machine fails me. Also thanks Alfanso for your extensive work and contributions on baguettes. They're my current white whale and your posts, videos and advice is great to have. (or at least Queequog). Anything but Moby or Ahab... Thanks for the mention. PS don't try that peel with your shirts in the oven, there are better ways to dry clothing. Or if you must, use someone else's clothing! Hahaha Thanks Ishmael :P But really, thank YOU. I've watched your videos and have your scoring Do's and Don'ts bookmarked. Hey everyone, it wouldn't be to hard to make a super peel at home. You can have half a paper/towel/linen under a pizza peel and half over the peel, and put your bread on top as it would go into the oven. Then put the peel deep into the oven and move it back while pulling the bottom half of the linen, et voila, homemade super peel! Compared to the pizza method, it's sturdier on the sides and flatter on the surface (the pizza box bends a bit), but it's a bit trickier to pull off because you need to both move the peel and pull the linen at the same speed. However, I haven't tried this and I'm word about the heat causing the cloth to catch fire so if anyone's going to try this, take extra care. I made a few different sized peels using bakers non stick pastry cloth and have used them for years. I have not had any issue with burning when using in a normal oven with a pizza stone . The one i made for using in a Blackstone Pizza oven has gotten some burn marks at the end where it gets very close to the flame, though I dampen the end with water and it hasn't gotten worse, though I still use it every week. YMMV. Thanks for sharing your experience! This is great information! What material is the pastry cloth made out of? and the users say that once i is dusted with flour it is non stick. I guess you could also use couche , https://amazon.com/Orblue-Bakers-Couche-Proofing-Cloth/dp/B0728B4RT1/ref=sr_1_5?ie=UTF8&qid=1534200120&sr=8-5&keywords=couche which is non stick as well, though I think a thinner cloth, like the pastry cloth works better. Thanks! Sadly in my country such things are very hard to find. We do have fabric shops that can sell cotton and linen though. Lance's smartpeel uses a couche like your suggestion so potentially a cheap couche (linen canvas) could work too. Well, I may as well plug my Smartpeel design - it's still going strong with the original cloth and used weekly. No problem and thanks, PP! I don't have the device in commercial production, so I don't mind what ideas you pull off of it. I've done a minor mod to the design since my original post to keep the underneath sliding cross dowel captive in the U channel - it was prone to slipping out. Anytime! It's always good to see good designs.Did you add screws to the back so that it doesn't fall out if you keep pulling or would it fall out by rotating? If it's a rotation thing, how did you mod it? It slipped out because sometimes the dowel didn't stay parallel to the loading edge of the peel. I found some PTFE tubing that was a tight fit on the dowel and fitted a small length on each end of the dowel, then pinned it in place with steel pins for good measure. 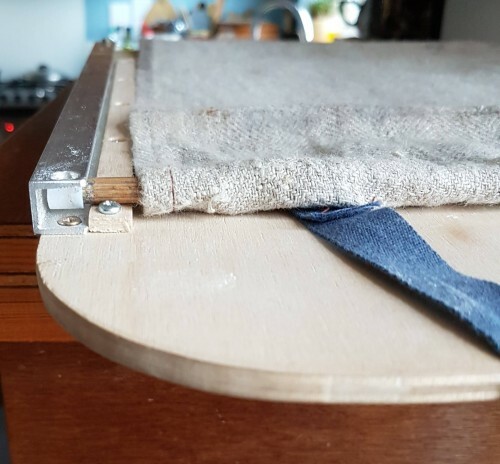 These ends then stay captive in the U channel by butting up a thin strip (10mm) of 3mm birch ply along the edge of the U channel, screwed to the main board. Ahh so the flat edge of the tubing between the tubing's curved edge and the dowel's is up against the birch ply forcing it to be stay in the U? That's some great ingenuity right there! Thanks for letting me know Lance! That's a great solution to the problem. It looks like it has the added benefit of stopping the dowel from falling out the back as well. It looks great!